Women (ages 19 – 45) who are discerning a religious vocation are invited to join us for a weekend of sharing in our life of prayer and apostolate. The weekend will consist of Masses, communal prayer, talks, visits with patients, opportunities to speak with the Sisters and opportunities for questions and discussion. 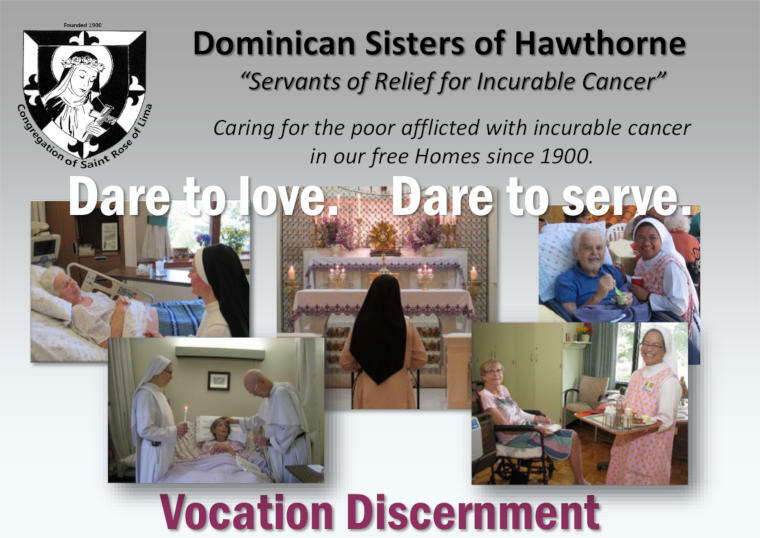 The Dominican Sisters of Hawthorne were founded in 1900 by Rose Hawthorne, daughter of the famed novelist Nathaniel Hawthorne. Our apostolate is to care for incurable cancer patients who cannot afford the care they need. Our Lady of Perpetual Help Home in Atlanta was founded seventy six years ago. For information or to RSVP, contact Sister Catherine Marie, O.P.